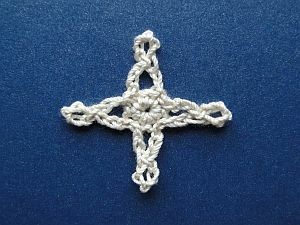 I worked the star in size 10 cotton thread with a 1.75 mm hook. It measures 1½"/3½ cm across. My star also looks like a cross, doesn't it? I think you could use this piece either as an appliqué or as an ornament. It's ever so easy and won't take you more than a few minutes to complete. Round 1 - Center Circle: ch 2, 8 sc into 2nd ch from hook, join with a ss into 1st sc. We will join into this ss at the end. Round 2 - Points: (ch 8, ss into 6th ch from hook, ch 3, ss into each of next 2 stitches on circle) 3 times. Ch 8, ss into 6th ch from hook, ch 3, ss into next stitch on circle, ss into joining ss from last round. Weave this tail end to the back through the same stitch you just slip-stitched into, then weave in securely. Round 1 - Centre Circle: ch 2, 8 dc into 2nd ch from hook, join with a ss into 1st dc. We will join into this ss at the end.